Continuing the series on the Moon. When a navigator measures the altitude of the Moon, there are several corrections that he has to make to the readings. Corrections For The Moon’s Semi-Diameter. The point on the Moon’s circumference nearest to the horizon is called the lower limb and the point furthest from the horizon is called the upper limb. When the Moon is not full, sometimes only the upper limb will be visible and sometimes only the lower limb. From the diagram below it can be seen that sometimes, depending on the phase of the Moon, either the upper or the lower limb cannot be seen. It should be noted that whether the Moon’s upper or lower limb is visible is dependent not only on its phase but also on the relative altitudes of the Sun and the Moon. For example, if, one morning, a crescent or gibbous moon is visible in the eastern sky and the Sun is at a higher altitude, only the upper limb will be visible but if, in the evening of the same day, the Moon is visible in the western sky and the Sun has set below the western horizon, only the lower limb will be visible. In navigational practice, the altitude that we measure is that of the lower limb; however, when the lower limb cannot be seen, we have no choice other than to measure the altitude of the upper limb. Regardless of which limb we use, what we really need is the altitude of the Moon’s centre so we must either add or subtract the value of its semi-diameter. 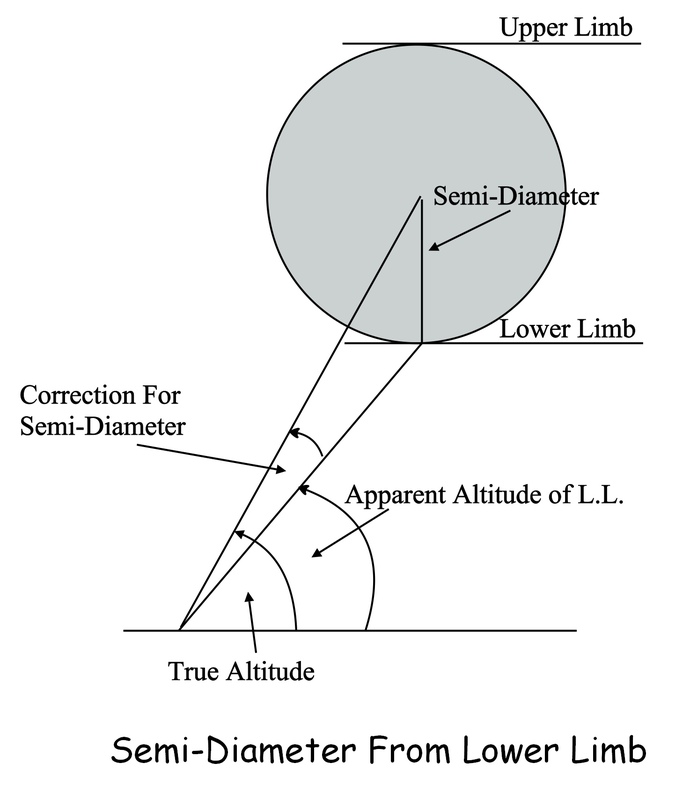 The following diagram shows why the semi-diameter must be added when the altitude when the lower limb is measured. Based on the assumption that the lower limb will normally be used for altitude measurements, 30’ is added to the corrections during compilation of the Moon altitude tables to allow for semi-diameter. Therefore, when the upper limb is used, the 30’ must be subtracted. As the Moon travels around its orbit and its distance from the Earth changes, so the value of the visible moon’s semi-diameter will change. The value of the Moon’s semi-diameter for each day is given in the daily pages of the Nautical Almanac. Corrections For Refraction. When a ray of light from a celestial body passes through the Earth’s atmosphere, it becomes bent through refraction and causes the apparent altitude to be greater than the true altitude. 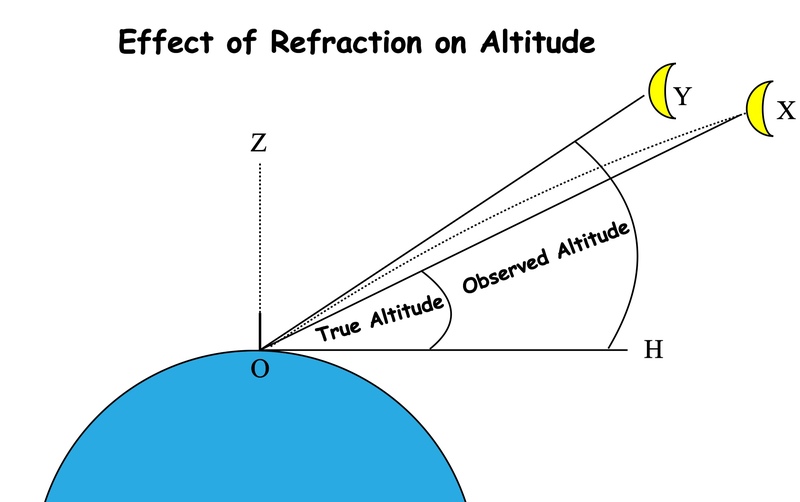 Since the sextant measures the apparent altitude, a correction for refraction must be applied to find the true altitude. Refraction is at its greatest when the altitude is small (i.e. when the celestial body is near the horizon) and becomes less as the altitude increases. The effects of refraction are illustrated in the diagram below. O is the observer’s position and Z is the zenith at that point. OH is the horizon. XOH is the true altitude of the Moon from the observer’s position. However, due to refraction, the celestial body appears to be at Y and so YOH becomes the observed altitude and a correction will have to be made to compensate for this. Corrections For Parallax. We measure the altitude of a celestial body from our position in relation to our visible horizon; this is known as the observed altitude. However, when calculating the true altitude, measurements are made from the Earth’s centre in relation to the celestial horizon. The displacement between the observed position of an object and the true position is known as parallax. Parallax corrections for the Moon. Because the Sun and the Moon are relatively close to the Earth, parallax will be significant and so a correction has to be made. These corrections are included in the altitude correction tables in the Nautical Almanac. Horizontal Parallax. 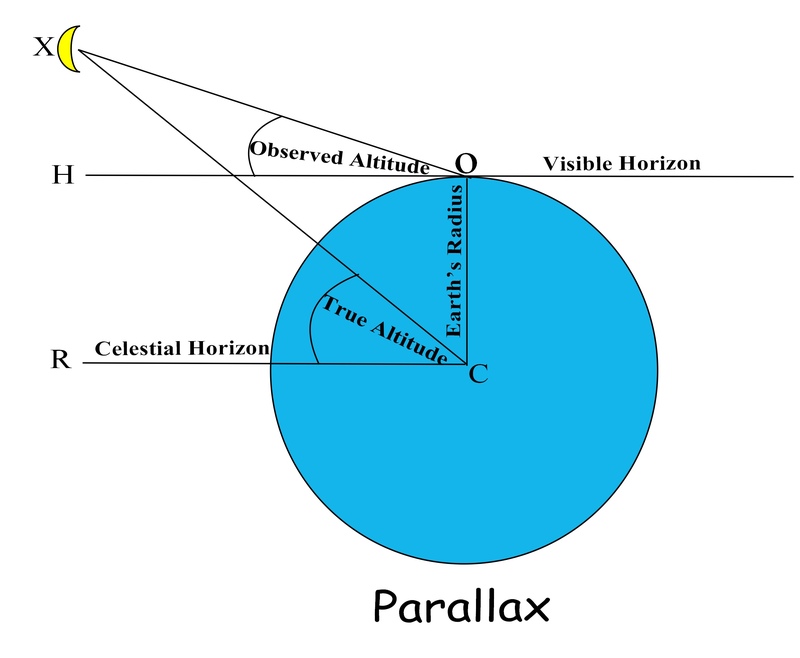 Parallax error is greatest when the celestial body is close to the horizon and decreases to zero as the altitude approaches 90o. It is negligible except in the case of the Moon which is close to the Earth in comparison with the other celestial bodies. Because horizontal parallax is significant in the case of the Moon, a separate correction has to be applied. The hourly values of horizontal parallax for the Moon are listed in the daily pages of the Nautical Almanac. 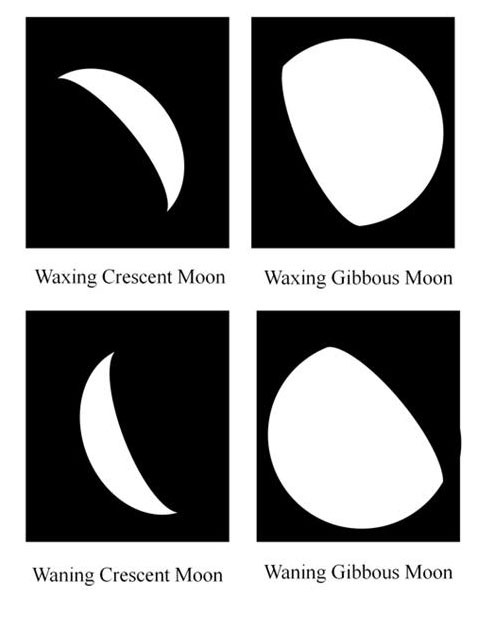 Links: Lunar Distance Phases of the Moon Tidal Effects of the Moon. This entry was posted in astro navigation, celestial navigation, Uncategorized and tagged astro navigation, astronomy, celestial navigation, celestial navigation made easy, Naigation training, navigation. Bookmark the permalink.